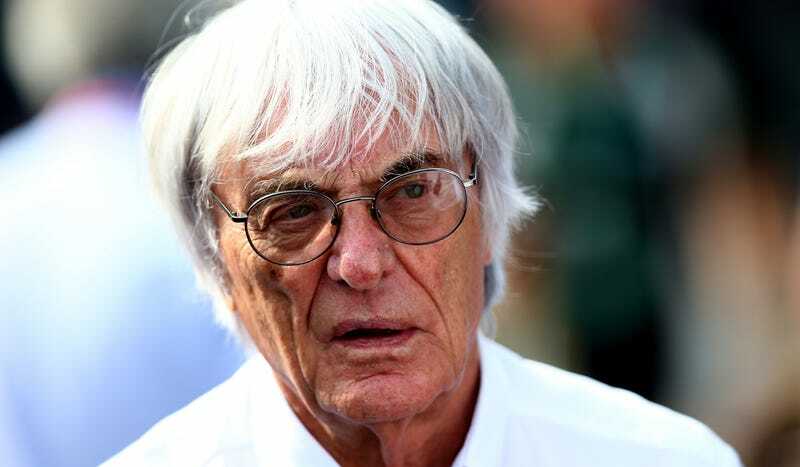 Oh hey look, Formula One supremo Bernie Ecclestone is back to saying dumb things about women. Now he told Canadian radio station TSN Toronto 1050 that a female driver wouldn’t be taken seriously enough to make it in Formula One. That’s cute, because no one should take anything that comes out of Bernie’s mouth seriously, either. I doubt it, because if there was somebody that was capable, they wouldn’t be taken serious anyway, so they would never have a car that is capable of competing. No credible reason was given to back up this comment, of course. Nothing was mentioned of the fact that it’s such a rarity to see women in motorsport that of course you’ll see more competitive men come through by sheer numbers alone. According to NBC Sports, the last woman to drive in F1 in a non-reserve/test role was Giovanna Amati in 1992. When one of the few women who landed an F1 test role in recent years—Susie Wolff—leaves the sport to form an initiative to encourage women to get involved in motorsport, maybe, just maybe there’s an unnecessary perception that your sport’s a pricey boys’ club. This female driver business – there was a girl that was driving in GP3 for a whole season, so it’s not something that hasn’t happened. Admittedly, Jorda’s not the best example, as she’s not exactly there thanks to a solid driving record. That being said, every driver (male or female) in F1 seems to get there on some kind of “in,” be it talent, connections, money, more money, or some combination of those things. Furthermore, glossing over all of the other women rising up through the support series on talent at the moment is disingenuous at best. But hey! Using one cheery, marketable face to back up the idea that an entire gender—which has been largely discouraged from participating in the sport throughout history—can’t be taken seriously is just one of many egregiously boneheaded remarks to come out of the Formula One CEO’s mouth. Let’s take a look at some of Bernie’s recent greatest hits, shall we? Saying F1 grid passes are for “people of note” and “glamorous ladies” instead of, you know, fans? Sure, it would be equally dishonest of me not to recognize that there are occasional moments of lucidity from Ecclestone, such as when he admitted that F1 isn’t putting on the best show right now. But someone’s in charge of this series that’s supposedly slowly whirring into the toilet to the sound of an expensive hybrid V6 turbo, right? Right? Personally, I believe it’s just the aging brain of a man forever stuck in the 1950s at work. That brain shouldn’t be heading up the pinnacle of motorsport and leading it into a new era. That brain should be talking to houseplants about how Tesco ran out of the good cheese this time. F1 needs to innovate—badly. It can’t blindly follow the money without protecting the things that endear the sport to fans, such as classic tracks, fantastic driving and wild feats of engineering. It needs to put content in front of those fans in formats that fans want to watch, which means embracing online platforms. And for heaven’s sake, you’re not going to sell a sport in the 21st century to any new fans if they perceive it as elitist towards any single category of people, female, American or otherwise. It’s time to stop taking Bernie Ecclestone seriously.